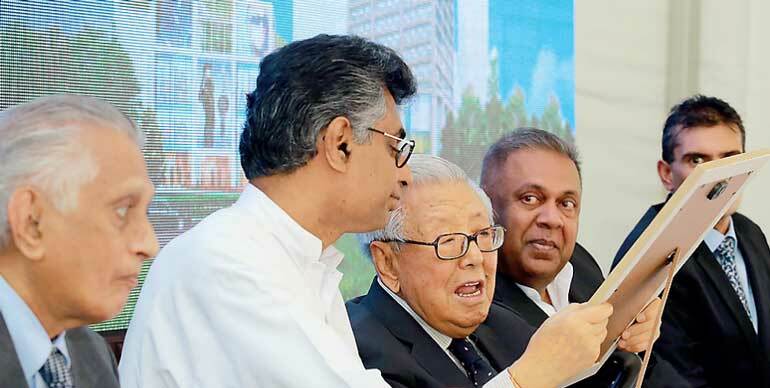 Havelock City, the premier integrated mixed-use development project in Sri Lanka, yesterday broke ground for its latest venture costing $ 166 million in the presence of iconic investor S. P. Tao of Singapore and Foreign Minister Mangala Samaraweera. The Board of Investment- approved Havelock City Commercial Development is a project being led by Mireka Capital Land, a joint venture between Overseas Realty Ceylon, the owner, developer and manager of the iconic World Trade Centre (WTC) Colombo and Bank of Ceylon. The project will be completed by 2020. Speaking at the event, Overseas Realty Ceylon PLC CEO Pravir Samarasinghe said they were quite confident that the ‘Mireka Tower’ would be a sought after Grade A office space while the shopping mall would be a thriving destination to serve people’s lifestyle needs. The Havelock City Commercial Development comprises a 46-storeyed 600,000 square foot office tower along with a 200,000 square foot shopping mall that will be built to international standards and will be the tallest building in Sri Lanka as well as a landmark in the vicinity and transform the skyline of Colombo. The project will be complemented by two basement floors for parking with nearly 900,000 car parking slots. 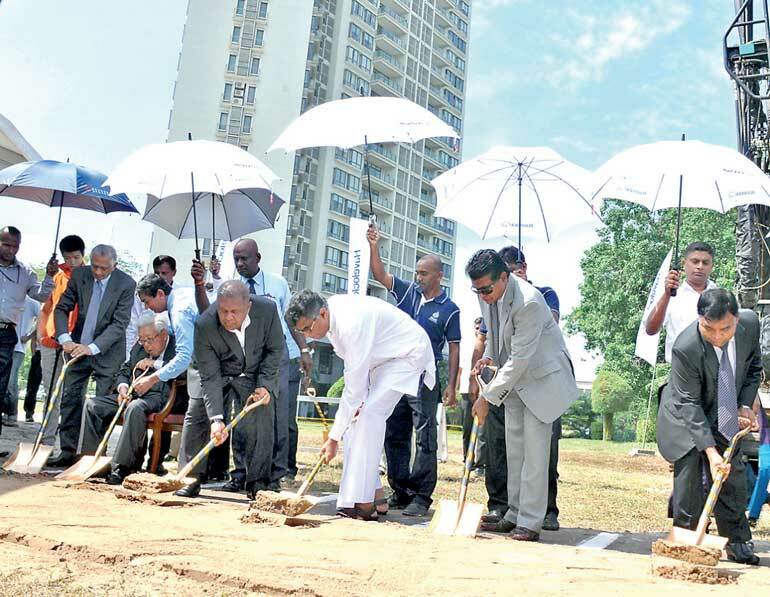 Samarasinghe acknowledged that this mega integrated mixed used development Havelock City is the brainchild of Overseas Realty Ceylon Plc Chairman S.P. Tao. Havelock City is the largest integrated mixed used development project in Sri Lanka, spanning an 18-acre block of land which has both residential and commercial components. He asserted that the office tower housing Grade A premium office space was designed to be a LEED Gold certified building and is built to the highest standards that enables space planning through column-free, wide floor plates. It is a smart functioning infrastructure with computerised car park, elevator and building management systems. “For the commercial development we collected a team of first-in-class consultants such as P&T Group, BECCA, Index Design, Rider LevetteBucknail, LJ Energy and Jones Lang Lasalle to design and develop the project,” he added. Elaborating on the shopping mall, he said it was designed and developed to be a community level mega shopping centre which would have a fine blend of fashion, convenience stores, F&B and entertainment with a mega multiplex complex with six screens and nearly 1,300 seats. In addition, Samarasinghe said that the residential component, once completed, will comprise 10 towers with 1,300 apartments where the firm has already completed four towers with 450 units sold, while another four towers with 600 units are under construction. Chief Guest Minister Samaraweera assured that the property development industry was bound to grow going forward and has great potential to attract investment to the country. The Minister acknowledged Tao’s presence as an investor at the peak of the conflict when Sri Lanka was in much need of foreign direct investment (FDI), adding that the country could not and would not forget such people. Noting that a proper shopping mall has not been built in Sri Lanka for the past 25 years, the Minister stated that it was time that Sri Lanka looked towards neighbouring countries where the shopping mall concept had grown rapidly with large developments. Megapolis and Western Development Minister Patali Champika Ranawaka commended the timely and essential intervention of property development. He said 2017 would be the beginning of a new era of fresh economic nationalism and a year of transition. Iconic investor and Overseas Realty Ceylon Plc Chairman S.P. Tao said that he was a fervent believer that the property market was the biggest enterprise in any leading city in the world and its development tracks a country’s social and economic success. “Having achieved my great age of 100 years and witnessed considerable changes regionally and globally, I am even more bullish on the growth prospects of Sri Lanka,” he added. He said that upon its completion in 2020, the commercial development of Havelock City would boast yet another iconic building in Colombo. “My first business foray in Sri Lanka was when I assisted the Government of Sri Lanka in 1970 to set up the Ceylon Shipping Cooperation through the sale of my ship MV Lanka Rani. I was convinced then, 46 years ago, that Sri Lanka would be a vital distribution maritime container transhipment hub for the Gulf and South Asia. Today, with China’s development of its One Road, One Belt strategy, Sri Lanka’s importance as a maritime centre is secured,” he stated. “My family and I are extremely proud to be part of the growth as long-term investors in Overseas Realty (Ceylon) Plc, the premier listed property company in Sri Lanka,” Tao added.